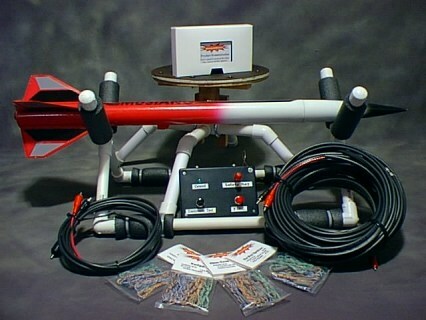 Essence's Model Rocketry Reviews is pleased to announce something different for our summer contest. Proverb (prov'uhrb) - a short popular saying, usu. of unknown and ancient origin, that expresses effectively some commonplace truth or useful thought; adage; saw. You can alter existing proverbs such as: "There are two perfect men; one dead, and the other unborn." -Chinese proverb could become "There are two perfect rockets; one lost, and the other not built." Or you can make up your own. It can be a proverb, or even a Murphy's Law type saying, but it has to do with rockets. Winners will be judged by EMRR Guests during a voting week of September 5 - September 11, 2004. They will be looking for the funniest, most true, and favorite ones. Contest is over on 9/4/2004. Online Voting will take place from 9/5 - 9/11. One $10 Gift Certificate for something of your choice! Edward Shihadeh "Tis better to have flown and lost, then never to have flown at all"
Peter Valenteen "Give a man a RTF rocket, and he has fun for a day. Teach a man to build rockets, and he has fun for a lifetime." Jim Myers "SHRED= Should Have Read the Epoxy Directions"
Bruce Levison "If you can't afford the kit; clone it!" James Gartrell "My ex-wife told me if I didn't grow up and stop flying rockets, she was leaving." Stuart Lenz "I have never lost a rocket, only made room for some new ones." Mike Mistele "The likelihood of a successful launch is inversely proportional to the number of people watching." Scott Simka "Bigger Rockets Require Deeper Pockets"
Jeff Short "If you cant afford to loose it then you cant afford to fly it." 1 Cliff Sojourner "A thing worth doing is worth overdoing!" 2 Gordon Agnello "How can we be done flying? I have motors left!" 3 Edward Shihadeh "Tis better to have flown and lost, then never to have flown at all"
4 Steve Kristal "I built it, I can fix it!" 5 Greg Lewis-Paley "Why fly low and slow? It just costs more per foot!" 6 Greg Lewis-Paley "If at first you don't succeed, burn more and more motors until you do!" 7 Stuart Lenz "If some is good and more is better, then too much ought to be just right." 8 Mike Mistele "The likelihood of a successful launch is inversely proportional to the number of people watching." 9 Mike Mistele "If there is only one tree in a field, your rocket will find it anyway." 10 Jeff Short "Blow it up or Blow it out!" 11 Joe Policy "A rocket is only as good as it weakest fillet"
12 Joe Policy "You launch some, you lose some"
13 Joe Policy "If a rocket is worth launching, it is worth launching well"
14 Mike Goss "Build, Fly, Crash, Repair, Repeat." 15 Donald Besaw Jr "Why are there parts left over from my RMS assembly? Maybe because you forgot to do something, better go back and read the instructions again unless you want your rocket to crash to the ground in a ball of flame." 16 Bill Eichelberger "Model Rocketry - Because you can only watch so many of your kid's soccer games." 17 Jeff Short "The probability of a successful flight is inversely proportional to the quality of the paint job." 18 Jeff Short "If you cant afford to loose it then you cant afford to fly it." 19 Art Applewhite "Build 'em short and wide, fly 'em slow and low." 20 Mike Shultz "Mama always said, 'Launching rockets is like a box of chocolates, you never know what you're going to get.'" 21 Dave Landgraf "If you don't like my rocket, dial 1-800-EAT-SMOKE"
22 Dave Landgraf "Which came first, the motor or the rocket?" 23 Dave Landgraf "What you don't know WILL hurt you!" 25 Donald Ball "If I didn't do something correctly, I soon will find out, Just Push the Button!" 26 Donald Ball "C.A.T.O. = Can't Afford the O-Rings"
27 Donald Ball "A Rocket in Hand, is worth two in the Tree"
28 Matthew Udomphol "How can you launch a rocket with only one motor?" 29 Matthew Udomphol "A CATO makes you wiser"
30 Matthew Udomphol "To please several from a launch is worth several pieces of gold, but you can't please several with several pieces of gold"
31 John Arthur "A rocket launch a day keeps the doctor away." 32 Dwayne Surdu-Miller "Flying too high means flying too gone." 33 Scott McLeod "In thrust we trust"
34 Scott McLeod "It's made of cardboard - what could go wrong?" 35 Scott McLeod "The Universal Rocketry Answer: 'It Depends...'"
36 Michael Lohrum "If God meant man to fly, He would have given him the intelligence and desire to reach the heavens." 37 Fred Talasco "Gravity: It's not just a good idea, its a law!" 38 Scott Simka "It's like this; a man finally finds the perfect rocket the one of his dreams, altimeter too!! He hides it in a corner of the store where no one looks (behind the trains). He goes home and sells all that he has. Then he goes back and buys the store." "You can rebuild it. You have the technology. You have the capability to make the world's first. 40 Bruce Levison "The size of an igniter can never exceed that of the motor!" 41 Bruce Levison "Why do you think they call it "Dog Barf"." 42 Bruce Levison "If you can't afford the kit; clone it!" 43 Al Gloer "Yea though I search thru brush and bramble, I shall find my rocket for it beeps." 44 Al Gloer "You can shoot a rocket into the sky, You cannot make it come down where you want." 45 Al Gloer "It does not matter how far a rocket goes, so long as it goes up." 46 Alan Tuskes "Ballistic recovery is ALWAYS funny when it's the other guy's rocket." 47 Alan Tuskes "Pleasure derived from someone else's failed flight is directly proportional to the amount of time and money spent on the rocket in the first place." 48 Stephen Peart "A bad day at the launch site is better than a good day at work." 49 Kevin Timmins "Why Sim your model? Flying it is much more accurate.."
50 Jason Toft "Whatever goes up, must come down...it's just a matter of where!" 52 ScottE Turnbull "If at first you don't succeed, you might want to look into dual deployment." 53 ScottE Turnbull "A bird in the hand is worth two in the cornfield." 54 Jacob Dennis "I came, I flew, I crashed"
55 Jim Myers "If you aint fixin, you aint been flyin"
Ejection at apogee and soft landing 50 feet from the pad - priceless! 57 David Fergus Proverbs 27:6a "You learn the most from failed flights." 58 Michael Lohrum "If God meant man to fly, He would have given him the intelligence and desire to reach the heavens." 59 Greg Deeter "Trajectory excursion"
60 Stuart Lenz "I have never lost a rocket, only made room for some new ones." 61 Niall Oswald "In times of doubt, apply the (MARS) principle: It Will Be Fine (TM)"
62 Scott Simka "Woe to the man who feels inadequate around men with bigger rockets. In his persuit of a bigger rocket he will never find true happiness. Someone will always have one bigger. Wise is the man that can find happiness in a small rocket." 63 Lamar Martinez "Eenstrawkshuns!?! I don't need no steenkeen eenstrawkshuns!!" 64 Mike Salter "E=MC^2 --- Excitement=Motor * Countdown^2"
65 Robert Theobald "What goes up, must come down." 66 Peter Valenteen "Give a man a RTF rocket, and he has fun for a day. Teach a man to build rockets, and he has fun for a lifetime." 67 Steve Carr "When asked "Did you find it?" The proper reply must be "No, But I can safely say I know where it did not land." 68 Scott Simka "Bigger Rockets Require Deeper Pockets"
69 Mike O'Malley "Build 'em; Fly 'em; Life is good..."
70 James Gartrell "To air is human, to fly rockets....divine!" 71 James Gartrell "My ex-wife told me if I didn't grow up and stop flying rockets, she was leaving." 72 James Gartrell "Outside of a dog, a rocket is man's best friend. Inside of a dog, there isn't any room to fly." 73 Keoki Gray "The journey of a thousand miles begins with a single step. (Shoulda used a streamer!)" 74 Keoki Gray "A rocket on the pad is worth two in the bush." 75 Keoki Gray "Tragedy is when I chip my new paint job. Comedy is when your Saturn 5 CATO's on the Pad." 76 Cynthia Parker "One rocketeer's trash is another rocketeer's treasure." 77 Cliff Sojourner "Let us create vessels and sails adjusted to the heavenly ether, and there will be plenty of people unafraid of the empty wastes." 78 Cliff Sojourner "That might be one small step for Neil, but it's one big step for me!" -- Buzz Aldrin, July 1969. 79 Denny Pyles "There is no such thing as a "CATO" as long as I have duct tape!" 81 Doug Gardei "I just love the smell of APCP in the morning"
82 Doug Gardei "I just love the smell of BP in the morning"
83 Greg Deeter "Ballistic trajectory"
84 Clive Davis "Rocketry is a great metaphor for life: we all have ups and downs, successes and failures. Either way, it's spectacular!" 85 Clive Davis "BP: it's what's for dinner!" 86 Clive Davis "Do you build to fly or fly to build?" 87 Dennis McClain-Furmanski "The meek shall inherit the Earth. 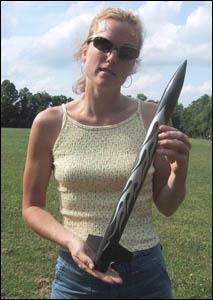 The rest of us fly rockets." 88 Dennis McClain-Furmanski "My Other Car Goes STRAIGHT UP"
89 Dennis McClain-Furmanski "We choose to build rockets, not because it is easy, but because it is hard." 90 Bill Krosney "If at first you don't succeed, fly, fly again"
91 Bill Krosney "To fly or not to fly? There is NO question"
92 Bill Krosney "There are ONLY TWO TYPES OF ROCKETEERS; those who have lost rockets, and those who have yet to!" 93 Denny Pyles "I shot a rocket in the air. It fell to earth somewhere over there!" 94 Nat Kinsey "If you can't stand the heat, you're too close to the pads." 95 Edward Shihadeh "If at first you don't succeed. 96 Andrew Grippo "Rocket Safety and Quality Construction Outperforms Good Excuses, Don't Cut Corners!" 97 John Arthur "And so, my fellow Americans, ask not what your country can do for you; ask your friend in the country if you can launch rockets at his place." 98 Lawrence Baker Wise man say "Rocket flies like arrow, but fruit flies like banana"
99 Steve Carr Wise man say " There are no bad flights, only spectacular crashes"
100 Lawrence Baker "Always look a gift engine in the nozzle." 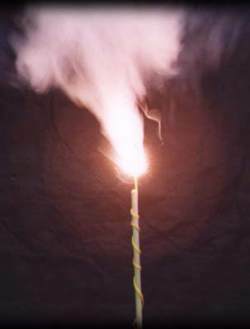 101 JW Slossar Excerpt from Biblical Rangebox reminder list: "Bringeth a rod and staff to free thy Rockets from trees causing them to lie down in Green pastures." 102 Blake Goddard "I wish I was LEGO Guy!" 103 Blake Goddard "Model Rocketry has taught me that NASA is miraculous." 104 Blake Goddard "Hot Glue is a poor bonding agent at any speed." 105 Mark Tuttle "There are tow ways to do things, neither one works in rocketry!" 106 Mark Van Luvender "A good flight is the best way to dust off your old models." 107 Mark Van Luvender "Carpe Epoxy"
108 Mark Van Luvender "If at first you don't succeed, ditch the Crapperhead and get a better ignitor." 109 Belinda Moore "One has to go through many crashes to be truely able to fly." 110 Belinda Moore "Life with me is guaranteed to be a blast." 111 Belinda Moore "It's a bird! It's a plane! It's my rocket heading straight toward me!" 112 Andy Turits "If a rocket falls in the forest and no one is there to find it...was it ever actually launched?" 113 Phil Hasty "3,2,1, launch! ...Did I put a 'chute in that one?" 114 Phil Hasty "Perfect flights are lots of fun, but CATOs are hilarious!" 116 Chuck Rudy "If you continue to launch rockets, Murphy will find you." 117 Chuck Rudy "Rockets....the badder they behave the funner they are to watch." 118 Chuck Rudy "If I never would have launched I never would have CATOed." 119 Whitney Richard "Keep looking." "It's got to be here somewhere." "I saw it land." 120 Lance Alligood "It's all fun and games until someone loses an "I"." 121 Bill Eichelberger "Life is a head's up flight." 125 Jim Myers "Don't worry kids, dad's just going through a phase"
126 Jim Myers "SHRED= Should Have Read the Epoxy Directions"
127 Bob Cox "The bigger they are, the harder they fall (especially when the chute doesn't open)." 128 Bob Cox "Faith can move mountains, but APCP works better in rockets." 129 Bob Cox "Silence is golden, but the throaty roar of a White Lightning motor is even better." 130 Drake Damerau "Old rockets never die, they just fade away." 131 Drake Damerau "Do not curse the rocket gods for trees, thank them nor not giving them legs." 132 Drake Damerau "Man cannot live by AP alone." 133 Art Applewhite "The man with one altimeter always knows how high his rocket went, the man with 2 altimeters is never quite sure." 134 Wes Rudy "Rocketry where mistakes are paied for immediately." 135 Wes Rudy "You know you did something wrong when your rocket comes back in small pieces." 136 Wes Rudy "Take a picture it'll last longer." 137 Andy Turits "Got rockets?" 138 Jeff Lane "The dog ate my rocket." 139 Jeff Lane "There are three kinds of lies: Lies, Damn lies, and ballistics!" 140 Paul Gray "Mach is a wonderful thing!" 141 Paul Gray "Mach is a wonderful thing! It does wonders to unaerodynamic rockets!" 142 Sean McCann "Always keep the pointy end pointed away from you, keep the smoky end pointed away from you, and never fly a U-shaped rocket." 143 Mark Tuttle "If at first you don't succeed, PUSH THE LAUNCH BUTTON AGAIN!" 144 Mark Tuttle "What goes up must come down, unless it catches a thermal." 145 Mark Tuttle "BL(a)RR = Build, launch, recover, repair." 146 Steve Michaels "The skill of the rocketeer is best tested flying the most difficult of rockets in the most difficult of conditions." 147 Greg Deeter "Trajectory excursion"
148 Jim Hinton "It wasn't a crash, it was a perfectly scale V-2 re-entry." 149 Jim Hinton "Physics don't scale." 149 Andy Turits "Happy trails to you, til we launch again"